The world’s best athletes arrive in London in less than 60 days and a Midland company has won a six-figure deal to supply medical equipment to ensure they leave in good shape. SP Services (UK), which already has clients including Manchester United and the Ministry of Defence has spent £2 million on new premises, five times larger than its existing unit, to cope with demand. 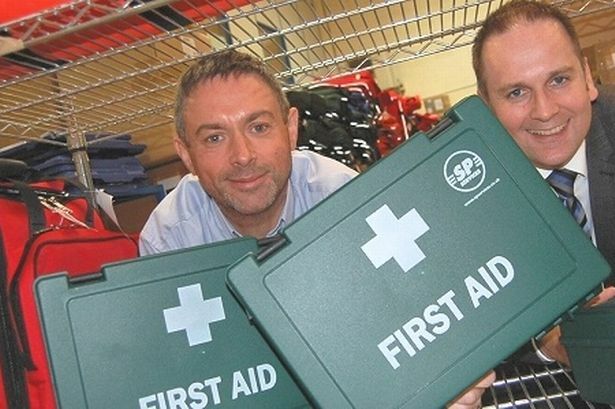 Based in Telford and established in 1989 by former hospital orderly and St John Ambulance volunteer Steve Bray, the company employs 33 staff with a turnover of £7 million. Mr Bray began his business by selling to ambulance friends and the army became the company’s biggest customer since the Gulf War. The 48-year-old said: “The business has grown rapidly in recent years – we are bulging at the seams. We have benefited from a diversified client base. ‘‘Back in ‘89 the whole ambulance sector and first aid was in its infancy. “I went to an exhibition in Derby and saw some products on sale and decided to get into that market. SP Services’ investment in its new 32,000 sq ft unit at Hortonwood Industrial Estate in Telford was supported by Barclays bank and will create 10 jobs to accommodate its increased stock in medical, first aid, ambulance, paramedic and rescue equipment, as it expands into new markets. The company received a £12,000 cash back payment from Barclays as it is one of the first Shropshire businesses eligible for the National Loan Guarantee Scheme. It plans to use the cash to set up a new office in Brisbane, Australia. Mr Bray, originally from Chiswick in London, now living in Telford, would not reveal the exact value of the Olympic contract, but said it was worth “hundreds of thousands of pounds”. SP Services’ new building will be called Bastion House, in recognition of its close links to Camp Bastion hospital in Afghanisan. Mr Bray added: “The chances are that if a soldier is treated for a trauma injury in Afghanistan, the medic’s kit will almost definitely contain supplies from SP Services which is very rewarding and brings a real sense of purpose to the business. “Despite the tough external environment in recent years, the needs of the emergency services worldwide and our commitment to satisfy those needs has not diminished. Midland firms have won around £530 million worth of Olympic contracts, including Acme Whistles, Birmingham, Zaun Fencing, Wolverhampton, Slick Seating, Redditch, Golden Bear Toys, Telford, which makes two of the mascots, Premier Group, Coventry, which manufactured 8,000 torches and Merrythought of Ironbridge. The US and Jamaican track and field teams will be based in Birmingham ahead of the games, as well as the Ukraine basketball team and the Pakistan hockey team. The Midlands lays claim to being the birthplace of the modern international Olympics, with the Wenlock Olympian Games being held regularly since 1850 in Much Wenlock, Shropshire.